A fun and easy read. Thoroughly enjoyed it from start to finish! I started reading this book and I never wanted to put it down. It has suspense, romance, and comedy. The writer makes you feel like you are inside the book. The characters and storyline is so relatable to real life. I really enjoyed this book! I'm looking forward to reading what happens next! A great fun read! Laugh out loud & totally relatable! Cleverly written and fun to read! I really enjoyed Charlotte’s adventure in the dating world! She learned how to step outside the box and challenge herself with the help of a podcast. The characters were well rounded and the book is cleverly written with several unexpected twists. This book was a touch challenging at first due to the English accents and phrases I wasn’t sure of but by the end it was very charming. I will definitely read Sophie Ranald again! When Charlotte’s best friend and roommate Maddy moves out to live with her boyfriend, Charlotte starts to question her life. She has been single for quite some time and can’t seem to get herself a date for the night never mind a long term partner. Desperate for answers she turns to Google which brings up a blog site about dating. The site might be old but the info still has to be relevant, doesn’t it? Via a series of Podcasts called Sorry, Not Sorry all about living your life to the full and enjoying yourself, Charlotte delves into a world she has never stepped foot in before, but will it lead to true love? 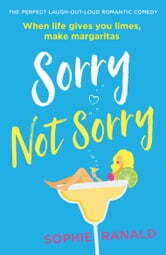 Sorry Not Sorry is an amusing tale of one woman willing to try anything to make her love life better. Her best friend is getting married, as well as leaving her in the lurch as all three of them were roomies – Charlotte, Best friend Maddy and her boyfriend Henry, and now Maddy and Henry have moved out to live together – How dare they!! We get to follow Charlotte as she goes through a list of challenges that are supposed to improve her life which will in turn bag her a man of her dreams, though it’s not plain sailing. The book made me giggle in parts but I found the pacing at the beginning a little slow and took a while to warm to the characters, including the new roommates. From about half-way, the book came alive and I raced to the finish line. If you are looking for a quick, easy read that will put a smile on your face, this is the book for you.